RayBio® Lectin Array 95. Detects glycan profiles using 95 lectins. Suitable for all liquid sample types. The Raybiotech lectin array uses standard glass slides each spotted with 8 wells of identical lectin arrays. Each lectin, together with the positive controls is arrayed in duplicate. The slides each come with a 8-well removable gasket which allows for the process of 8 samples using one slide. 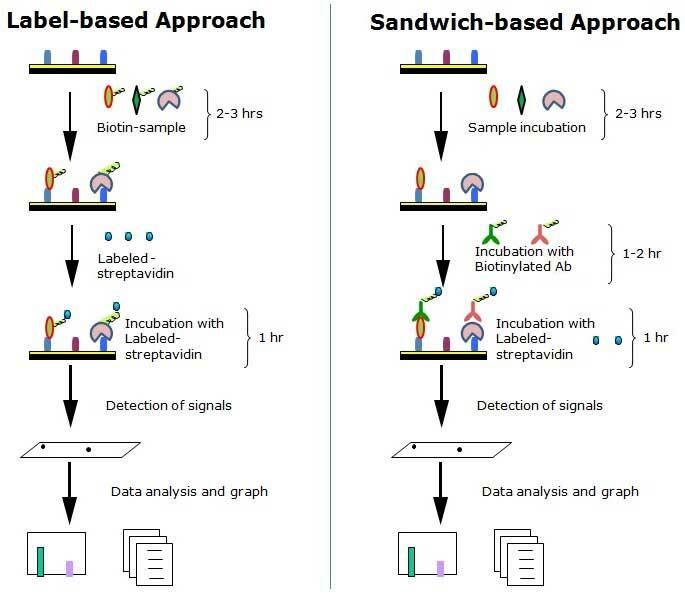 Four slide slides can be nested into a tray, which matches a standard microplate and allows for automated robotic high throughput process of 32 arrays simultaneously. The RayBiotech lectin array provides a powerful new tool for glycosylation determination, drug discovery and biomarker development; all with limited samples volumes required. After biotinylation of HRP we can determine what kind of glycans are conjugated to HRP by using the RayBiotech lectin array. Lectins, GNA, HHA, NPA showed strong signals after incubation with 0.33 ug/mL Biotin-HRP followed detection by streptavidin-fluorescence-dye (Figure A, B and C). The fluorescence signals from GNA, HHA and NPA can be blocked in a concentration depend manner by HRP itself (Figure A and B), which means that these fluorescence signals were generated based on the binding between HRP and the three lectins. As we know, GNA, HHA and NPA lectins specifically bind to mannose which indicates that HRP contains mannose. By adding increasing amount of mannose, the signal from GNA, HHA and NPA can be reduced (Figure A and C). 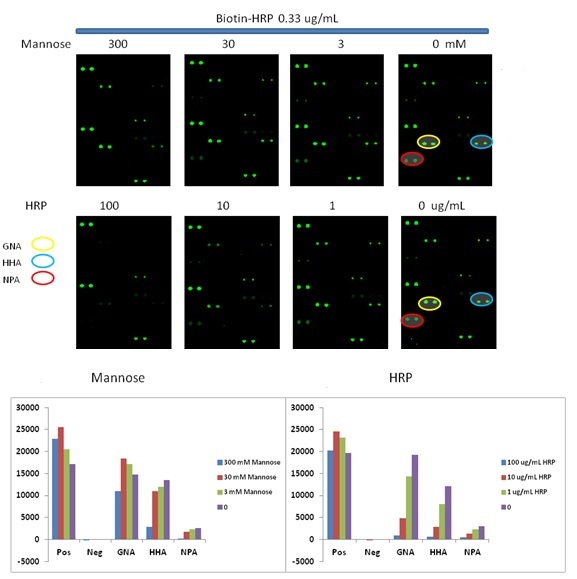 The reduction signals from increasing concentrations of mannose confirms that HRP protein contains mannose in its glycocalyx. Lectin VVA binds to the streptavidin-fluorescence dye. 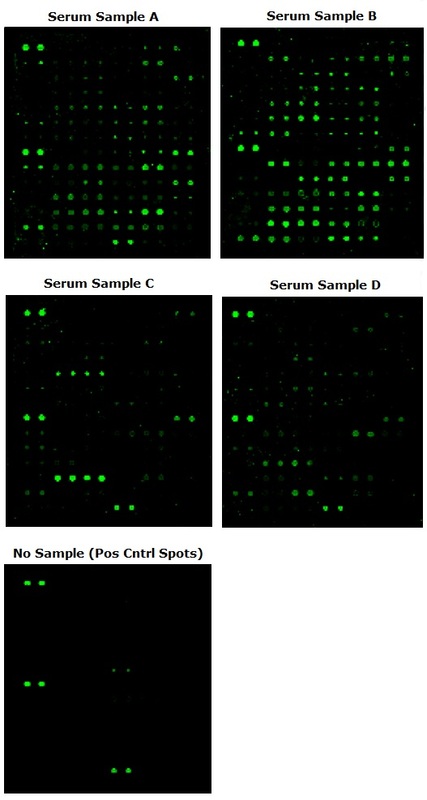 Using the lectin array, we can discover the different glycoprotein profiles of the serum samples or cell lysates from patient cohorts versus a control group. Below images showed the profiles of the glycans from serum samples detected by Biotin-anti-human IgG and Fluorescence dye-streptavidin. Quantitative analysis of lectin-glycoprotein interactions. Example: a concentration series of glycoproteins detected with the lectin array could reveal concentration dependent effects of lectin-glycan binding. 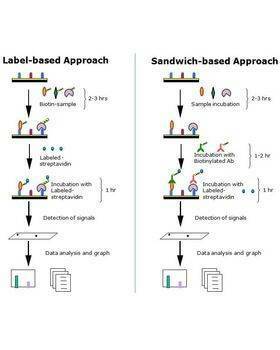 Determine the profile of bacterial cell-surface glycans. Example: Cell lysate from bacteria can be Biotinylated and hybridized to the lectin array. Analysis of the binding pattern and correlation with the known carbohydrate-binding specificities of the lectins can determine the glycans on the cell membrane. For the label-based principle, incubate the labeled-streptavidin. Upon receipt, all components of the Raybiotech Lectin Array 95 kit should be stored at -20°C. Once thawed, the glass slide and Cy3 equivalent dye-conjugated Streptavidin should be kept at 20°C and all other components may be stored at 4°C. The entire kit should be used within 6 months of purchase.